I’ve know about this movie since it was released. Finally, it came up in my Netflix queue, and I watched it last night. As a big fan of graphic novels (Pyongyang by Guy Delise is a favorite), especially nonfiction ones, I was pretty excited to see Marjane Satrapi’s work come to life. This happens all the time, I sucker myself into watching something animated on a emotionally hard day, thinking, “Hey, its animated, it will be light.” Okay, so I’m not always thinking clearly. This was one of those times. 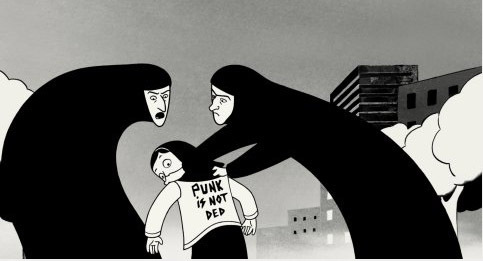 Persepolis is Marjane’s account of her life growing up in Iran during the revolution, the subsequent Islamic fundamentalist takeover and the Iran-Iraq war. A feisty, funny, intelligent child, she has a inquisitive nature that shapes her understanding of the sweeping changes that cover her country and affect her family and friends. Eventually her outspoken and liberal personality prompts her parents to send her to Vienna for school, and she becomes an expatriate. This is a grossly broad encapsulation of this movie on my part; it is so deeply rich and emotionally laden that a event by event breakdown would rob it of its passion and pathos. So I’ll say this: it ripped my heart out, but it was beautiful, and I loved it. Its not for everyone, sure. But it is brilliant and moving for those who are undergoing painful change. For many years, my family has kept a troubling secret. What has made things even more difficult is the fact that the person it involves was not only my grandmother, but one of Canada’s most beloved authors, Lucy Maud Montgomery. Her most famous novel, Anne of Green Gables, is still a bestseller after 100 years. In addition to Anne, my grandmother wrote 19 other novels, personal journals and hundreds of short stories and poems. As well, she has been the subject of several biographical studies. Despite her great success, it is known that she suffered from depression, that she was isolated, sad and filled with worry and dread for much of her life. But our family has never spoken publicly about the extent of her illness. What has never been revealed is that L.M. Montgomery took her own life at the age of 67 through a drug overdose. I wasn’t told the details of what happened, and I never saw the note she left, but I do know that it asked for forgiveness.After having read the poignant Breakdown series on mental health in The Globe and Mail during the summer, I was inspired to reflect upon my own family’s history with depression. Additionally, the recent focus on my grandmother’s creativity – this is the 100th anniversary of the publication of Anne of Green Gables, with events around the world celebrating Anne and her creator – has encouraged me to end our silence. I have come to feel very strongly that the stigma surrounding mental illness will be forever upon us as a society until we sweep away the misconception that depression happens to other people, not us – and most certainly not to our heroes and icons. Obviously it can happen to anyone. The public faces of such prominent Canadians as Roméo Dallaire, James Bartleman, Valerie Pringle and others who supported mental-health awareness during the Centre for Addiction and Mental Health’s recent publicity campaign have also had a powerful effect on me. But, most important, the legacy of L.M. Montgomery, and my grandfather, Rev. Ewan Macdonald, and its related responsibilities and joys, are taken very seriously by my family. I spoke with them before writing this essay and we agreed that it was important for us to share our family’s story. I never knew my grandmother. She died in 1942, before I was born. My grandfather, who also suffered from serious mental illness, died the following year. I got to know them through my father. After my two older brothers married and left home, I had my parents all to myself for a few short years before my father, a physician at St. Michael’s Hospital in Toronto, died in 1982. I became closer to him while I studied at the dining-room table – a time when we had a lot of conversations together. We developed a deeper connection during his last years and I am grateful for those memories of our time together. When the last volume of The Selected Journals of L.M. Montgomery was published in 2004, I sobbed through it and, in fact, I couldn’t even finish it – there was such a profound sadness for me in imagining how my father must have coped with two such depressed parents. For a young man in the prime of his life, it must have been an overwhelming responsibility. I remembered our late-night conversations and how he shared many memories, yet rarely talked about the burdens he must have felt during his young adult life. My heart aches for my father, who was left behind to deal with the grief of losing his beloved mother. He carried the secret of the circumstances of her death and maintained the façade of a proper and well-adjusted family because of his desire to protect them and their reputation in the community. L.M. Montgomery’s most famous character, Anne Shirley, declared, “My life is a perfect graveyard of buried hopes,” and readers find it one of Anne’s more endearing sayings. That particular lament has always been especially significant to me as I imagine my grandmother must have felt the same sadness at times in her life. The fictional Anne went on to happiness and a life full of love and fulfilment. My grandmother’s reality was not so positive, although she continues to inspire generations of readers with her books, which reveal her understanding of nature – both in matters of the heart and the world. Although she was a very successful author, her life was overshadowed by her depression, coping with her husband’s mental illness and the restrictions of her life as a clergyman’s wife and mother in an era when women’s roles were highly defined. Even though I never met them, I’ve always regarded my paternal grandparents with great affection because of their influence on my father and, therefore, on me. I grew up admiring their achievements, both professional and personal, through my father’s stories and reminiscences. My heart aches for them, as well, because I know they were part of a generation that simply did not acknowledge personal dysfunction, let alone seek help. I have great admiration for my grandmother, for her contribution to Canadian literature and culture, her strength of character, and the love, pride and sense of responsibility she gave to my family. I am proud of her courage, given how isolated and lonely she must have felt during certain periods of her life. I wish that her family or community had had some of the tools that are available today. I expect that most families continue to be bewildered about how to help loved ones who suffer from debilitating depression. I hope that by writing about my grandmother now there might be less secrecy and more awareness that will ease the unnecessary suffering so many people experience as a result of such depressions. The recent Globe and Mail series certainly sheds an encouraging light on the notion of the “perfect” family, acknowledging that it may include the reality of depression and other mental illness, and suggests that the shame surrounding these subjects may be lifting. I’ll never know if my grandmother might have been inclined to seek help if she had lived in a less judgmental era or if she had had access to supportive therapy or the medications available today. I would like to think so. I long to tell her how I wish her family could have known how to help her and how proud we all are of her accomplishments. I also wish that, while my father was still alive, my family could have helped one another more by talking more openly about our feelings around her death. We realize now that secrecy is not the way to deal with the reality of depression and other mental-health issues. Kate Macdonald Butler is the daughter of Stuart Macdonald, who was the youngest son of L.M. Montgomery. Of flotsam in your flood. A sweet little animation from when I was a kid – perfect for a day when I’m trying to keep it all in perspective.